If you’re considering what to bake for Mother’s Day, how about these pretty mini pies for Mother’s Day, or for National Apple Pie Day (May 14th)? We received the recipe from My Baking Addiction, a site with such tempting recipes that you’ll want to make them all. Currently featured on the home page are Banana Oatmeal Cookies, Marshmallow Treat Cupcakes, Rosé Cheesecake and Rumchata Cheesecake Pudding Shots. 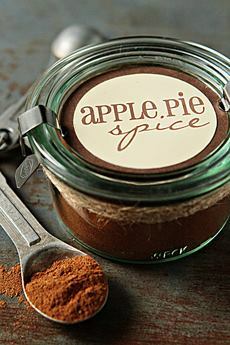 *Make your own apple pie spice with 1 tablespoon ground cinnamon, 1 teaspoon allspice, 1 teaspoon ground nutmeg, 1/2 teaspoon ground cloves and an optional dash of cardamom. These ingredients are very similar to pumpkin pie spice, which often contains some ginger. You can use them interchangeably. 1. PREPARE the pie dough as instructed (here’s a pie crust recipe if you need one). Once ready, roll out on a lightly floured surface. Using a 3-inch cookie cutter, punch out rounds of dough. Gently press the rounds into muffin tin wells. 2. GENTLY TOSS the sliced apples in the lemon juice. 3. PLACE the brown sugar, spice and butter in a small saucepan over medium-low heat. Stir and cook until the butter is melted, the sugar dissolved and the apples cooked through, about 4-5 minutes. Pour the mixture over the apples slices. Homemade apple pie is always a treat, but this recipe raises the bar (photos courtesy My Baking Addiction). 4. GENTLY coat the apples (we used our hands); then let sit for 10 minutes. Strain the apples slices and discard the liquid. Heat the oven to 350°F. 5. 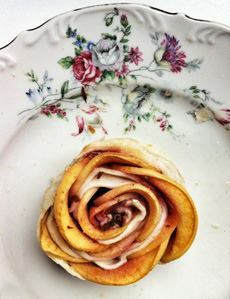 FORM the roses: Arrange 6-8 apple slices in a straight row, with each slice overlapping the next to create a 12-inch line. Starting with one end, gently roll the apples (see a video on how to roll roses) (here’s another one). Transfer each rolled apple onto an individual pie crust. 6. REPEAT until all the pie crusts are filled. Place the tin in the oven and bake until the crust is golden and apples have cooked, about 30 minutes.